Through the antenna located in the front of the CD-200BT, audio file playback signals can be received from a variety of Bluetooth compatible devices. The types of files that can be played back depend on the transmitting device; so any file type that can be played back by iTunes, Windows Media Player, smartphone player apps and other music applications can be played through this unit. Bluetooth playback uses a wireless connection, so no new wiring is necessary to use compatible audio sources as long as they are in signal-range, allowing easy and speedy playback. Bluetooth playback requires pairing. 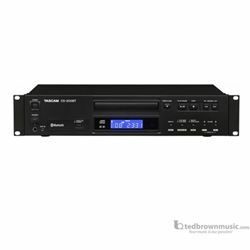 Normally, pairing is one to one, but the CD-200BT has a device selection function that can be used to pair with multiple transmitting devices. By registering devices to be used in advance, you can switch smoothly between transmission devices for playback with minimal connection interruption time. (Only one device can be used for playback at a time) In addition, since the name of the transmission device currently being used for audio playback can be shown on the display, you can check the connection status within this unit.